Nowadays, the development of technology rushes past the people of the machine-based technical civilisation, therefore they fail to understand the technological wonders that surround them. One of these is the ancient technology of iron smelting. Industrial archaeologists have found numerous Medieval bloomery workshops mainly from the period of the settlement of the Hungarians in the territory of present-day Hungary and from the Avar and Árpád Age (7-13th century). On the basis of the findings, the Medieval Hungarian iron culture may be reconstructed. furnaces (in which the iron was smelted and the iron bloom was produced). The main component of the technology was the furnace itself. 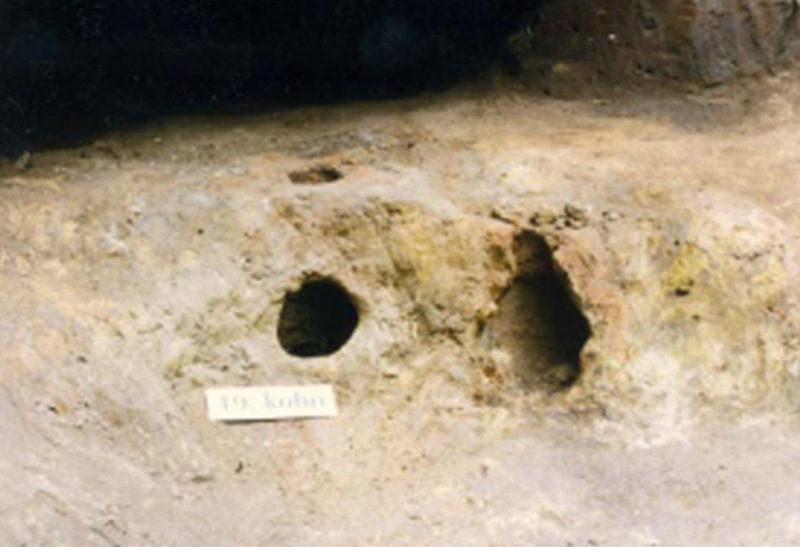 There were two types of the early Medieval bloomery furnaces located in the Carpathian Basin: the free-standing type and the embedded type furnace (See Figure 1)(Gömöri, 2000). For our experiments, we always used the embedded Somogyfajszi-type furnace, because this is a massive furnace and several smelting process could be carried out in the same furnace under the same, repeatable conditions. Somogyfajszi-type furnace was found first in the excavation of the bloomery workshop from the tenth century AD in Somogyfajsz (Gömöri, 2006). Similar embedded furnaces were used in the whole Somogy County, (see reports of archaeological excavations(Gallina and Somogyi, 2004. Gallina et al, 2007).). 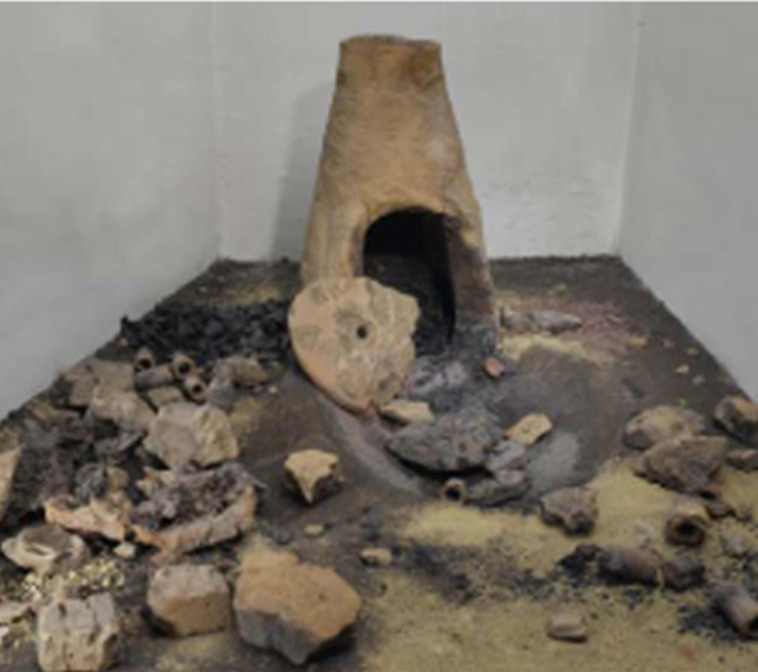 Based on the archaeological excavations the Fajszi type furnace was approximately 70-100 cm tall and was built into the side wall of a workshop pit. The workshop pits were 50-80 cm deep, 3-4 m wide and were either square or horse shoe shaped pits. There were several furnaces located in the side walls. These furnaces were conical with the inner diameter of the hearth being approximately 30-40 cm and the inner diameter of the throat being 10-15 cm. On the front side of the furnace there was a 20-30 cm wide hole which was closed during the smelting process using a breast-wall. A tuyere was put into the tuyere-hole in the breast-wall and one or two hand-bellows could be connected to the tuyere(Gömöri, 2000). It is important to emphasise that what we do is not only spectacular iron smelting experiments, but we revive the whole technological process from collecting bog iron ore to making iron products. Moreover, we can make pattern-welded steel using iron bloom which is the peak of the contemporary technology. This is unique worldwide. At most international symposiums the focus is only on the smelting experiments and the usual, using industrial iron ore with high Fe-content which guaranties the success of the process. The process of making charcoal follows the technological steps that we can see even today: the technology has not changed throughout the centuries. First, we chop the firewood (mainly oak) and we build a charcoal pile using about 2 m2 of the chopped firewood, leaving a chimney in the middle. Then we cover the pile with fallen leaves and grass so that the next layer - the soil - cannot leak in through the small vents. Afterwards, the pile is covered with a few centimetres of wet soil. The charcoal pile is ignited through the chimney: we drop pieces of burning wood and smouldering coals into the chimney and we cover the chimney when the pile starts to smoke. For the pyrolysis (the process whereby wood becomes charcoal by losing its water content) we make small ventilation holes on the side of the charcoal pile to let in some oxygen. 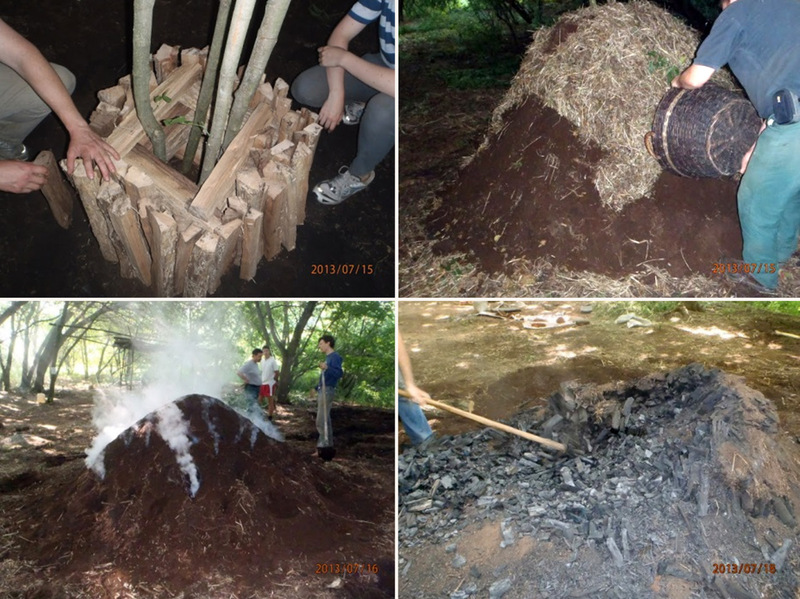 It takes about 70-80 hours for a 2 m2 charcoal pile to be ready. When the smoke coming from the pile becomes bluish-grey and the inside of the pile feels dry the pile is ready to be opened. Before opening the pile, we cover it with some more wet soil so that it cools down. When we open the pile, we make sure that the still smouldering charcoal pieces are sprinkled with water to avoid the danger of fire (See Figure 2). For our smelting experiments we use bog iron ore as opposed to industrial iron ore mined mainly from Banded iron formations (BIFs). The common characteristic features of bog iron ores are that they are situated close to the surface of the ground which makes them easy to collect. Secondly, they can be found on territories that used to be wetlands or marshes and are mainly produced by bacteria. In Hungary, bog iron ores can be found in two areas: in the Nyírség (the north-east of Hungary) and in Somogy County (in the south-west). In the Nyírség there is little archaeological evidence for any bloomery activity in the Middle Ages, up to now no traces of iron smelting were found, whereas in Somogy there are archaeological finds to prove that intensive iron smelting was going on in the Celtic, Roman, Avar and the Hungarian period as well (Gömöri, 2000). Bog iron ores form lenses under the ground, which can be found in the beds of brooks, where the brook has eroded one to two metres below ground level (see Thiele and Kecsmár,2013 for details about the geological and archaeometallurgical background of bog iron ores in Somogy County). From these lenses the iron ore can be collected with the help of spades, shovels and pickaxes. The collected iron ore lumps are then washed in a basket in the brook which washes away the dirt and sand. Before smelting we roast the iron ore in a roasting pit. The bottom of the pit is covered in clay so that no soil gets into the furnace with the iron ore. In the pit we make a big fire and put the pieces of iron ore into it, then let the fire burn for about ten hours. During this process the water content of the iron ore is released, and its structure becomes looser, which makes it easier to smelt. Finally, we break up the burnt iron ore into 2-3 cm pieces to make it easier to load the iron ore into the furnace during the smelting process (See Figure 3). The furnaces that we use for our smelting experiments are built into the side walls of a workshop pit (Gömöri, 2006). The best place for a workshop pit is usually in a slope in a forest where the trees give shade and some protection from the rain. The furnaces are built from clay mixed with sand, both of which we can find in the brook-beds and the surrounding area. When the furnace is ready it has to be dried out, which takes about one day. We usually make a fire inside the furnace to quicken the process. Before the smelting process we also make tuyere to connect the bellows and the furnace. The tuyere are also made of clay. It requires a lot of skill and experience to build a good, well-working furnace (See Figure 4). The smelting process starts with the pre-heating of the furnace. Once the furnace is pre-heated it is filled up with burning charcoal. On the top of this we add one layer of roasted bog iron ore and one layer of charcoal alternately. After about 2-3 hours, the slag is tapped from the furnace through a slag-tapping hole built into the breast wall of the furnace. The slag contains non-iron substances from the iron ore and some iron that could not be reduced from the ore. It is important to note that, unlike modern steel-making, the iron stays in a solid state throughout the smelting process. The iron bloom is formed in the hearth of the furnace. The structure of the iron bloom is sponge-like and it contains some slag. The smelting process ends when the iron bloom gets as big as the breast wall of the furnace so that it can be removed by breaking the breast wall only. This way, the furnace can be used again with a new breast wall. When the iron bloom is removed, it is compressed on a log with a wooden hammer. For one smelting experiment, we use about 20 kg roasted bog iron, 30 kg charcoal, and the whole smelting process lasts for 10-12 hours (See Figure 5). It is much more difficult to forge iron blooms than modern steel, as they are full of slag inclusions which open up during the forging process resulting in cracks in the material. If there are a lot of cracks, the structure of the iron bloom looks like a layered cake. In order to close the cracks forge-welding is applied. 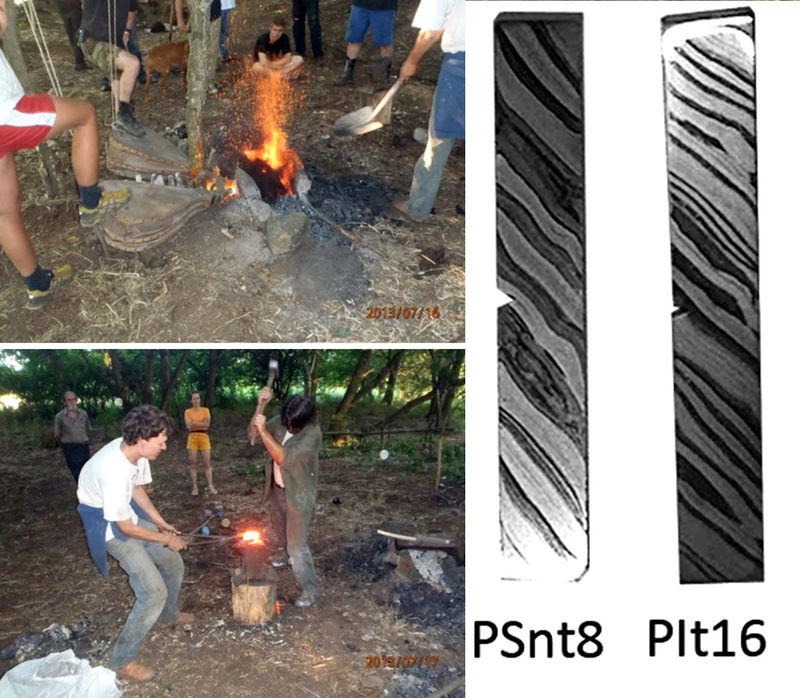 After many years of experiments, we can now forge even pattern-welded knife or sword blades using iron bloom (See Figure 6). GÖMÖRI, J., 2000. Az avar kori és Árpád-kori vaskohászat régészeti emlékei Pannóniában / Archaeometallurgical sites in Pannonia from the Avar and early Árpád period. Sopron, Soproni Múzeum Régészeti Gyûjteménye és az MTA VEAB Iparrégészeti és Archeometriai Munkabizottsága. GÖMÖRI, J., 2006. The Bloomery Museum at Somogyfajsz (Hungary) and some Archaeometallurgical Sites in Pannonia from the Avar and Early Hungarian Period, Metalurgija (Journal of Metallurgy Association of Metallurgical Engineers in Serbia), 186, pp. 183–196. GALLINA, Zs., SOMOGYI, K., 2004. Előzetes jelentés a Kaposvár-61-es elkerülő út 27. számú lelőhelyén 2002-ben végzett megelőző feltárásról / Preliminary report on the preceding excavation of the site number 27. of Route 61. encircling Kaposvá. Somogyi Múzeumok Közleményei, 16, pp. 185-192. GALLINA, Zs., HORNOK, P., SOMOGYI, K., 2007. Vorbericht über die archäologische Untersuchung eines awarischen Eisenverhüttungszentrums in der Gemeinde Zamárdi (Komitat Somogy Ungarn). In: Arts and Crafts in Medieval Rural Environment. Ruralia VI. Brepols, pp 71–81. HECKENAST, G., NOVÁKI, Gy., VASTAGH, G., ZOLTAY, E., 1968. A magyarországi vaskohászat története a korai középkorban / The history of Medieval iron smelting in Hungary. Budapest, Akadémia Kiadó. THIELE, Á., KECSMÁR, Zs., 2013. A belső-somogyi gyepvasérc telepek archeometallurgiai jelentősége és genetikája / Genetic types and archaeometallurgical role of bog iron ore deposits in Inner Somogy, Bányászati és Kohászati Lapok – Bányászat, 147(1), pp. 19-24. Fig 2. Steps of burning charcoal.